It is written in Heroic Couplets, a form of Iambic Pentameter. you never let me do my magic tricks. words of Literate Louie, the Scribe of the Tribe. eyes of an intelligent ape. heroic couplets. Each line has 10 syllables and the pairs of lines rhyme. While many lines were written in 10 syllables in very early Latin, it was Geoffrey Chaucer who added the meter and originated iambic pentameter in the English Language which was further immortalized in many plays and sonnets of William Shakespeare. of myths and canons are made. are bringing you Jon’s work. We think it’s very good. We hope you do too. and overthrew the House of Solomon. as by the epic tales our gaffers tell. Our tribal sagas give it high renown. The Age of Thinkers covers a time when the tribe reflected on their philosophy and their theology. 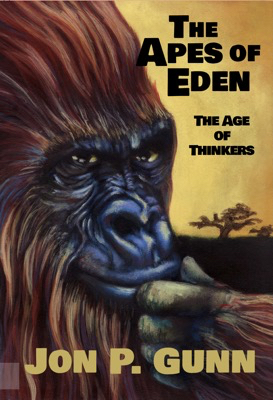 According to reviewer Jim Bennett, “You will probably laugh, as I did, at some of the ‘logical’ developments of thought, about Earth, God, Creation, the Trinity, and Prophets.” This is Book 5 of the Apes of Eden Saga. Coming Soon, The Writings of Louie. Can one literary work be an epic poem, a tutorial on philosophies from Mesopotamia to the present and a laugh-out-loud compendium of satirical humor? Welcome to The Apes of Eden – The Journey Begins. 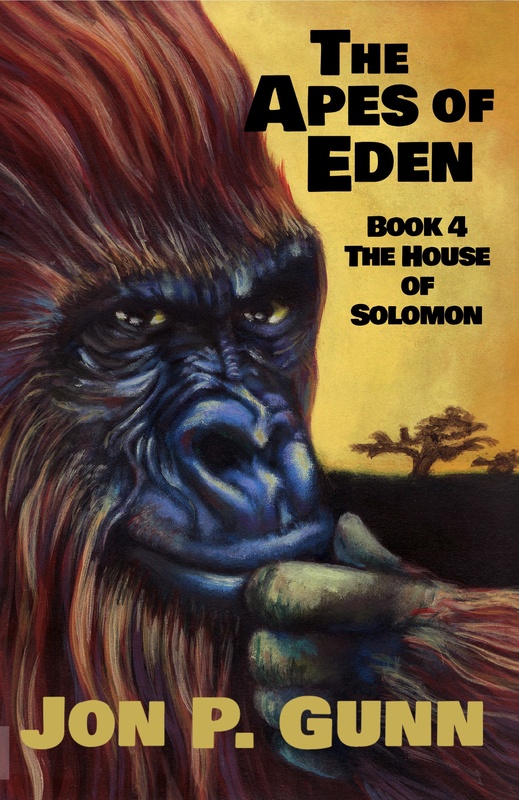 In the year 19067, a tribe of killer apes leaves Eden in search of God. They face evil creatures from Hell and Heaven alike. The story is told in the words of Literate Louie, the Scribe of the Tribe. A tribe of killer apes living an idyllic life in the Garden of Eden begins a monumental quest to search the post-apocalyptic Earth in search of God. The Journey Begins is the first of a trilogy. The Apes of Eden is written in iambic pentameter. It is a humorous look at religion and philosophy through the eyes of an intelligent ape. The Apes of Eden is written in rhymed iambic pentameter thus falling into the category called heroic couplets. Each line has 10 syllables and the pairs of lines rhyme. 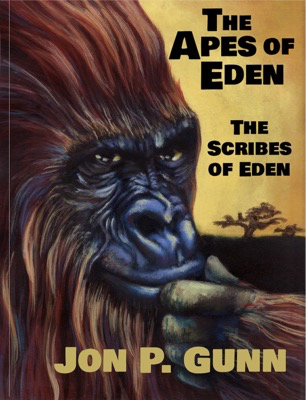 Jon P. Gunn wrote The Apes of Eden over a period of many, many years beginning as a teenager. He read Spenser, Chaucer, Dante and Cervantes. Many oddball philosophies, from solopsism to deism are explored and mocked. Allusions to a broad spectrum of myths and canons are made. Jon never graduated from college even though he had twice the number of hours to graduate. He was too busy reading the great works of literature to bother. He shared his work with a friend. It is that man and his friend, Rick Lakin who are bringing you Jon’s work. We think it’s very good. We hope you do too. and wrought no basic change of attitude.